It had been beastly hot, 100 degrees Fahrenheit even at 6,000 feet in elevation. Down in the desert, Phoenix was suffering a record-breaking temperature of 122. The forest was stressed by drought. Precipitation the winter of 1989-1990 had been below normal and everything waited for a spark like the proverbial tinder box. Years of poor forest management had left the forests overgrown with small, unhealthy trees and underbrush. The philosophy of the 20th century was to put out all forest fires, however, fire was a natural part of the eco-system and a valuable tool for Mother Nature to eliminate undergrowth and promote new, healthy growth. The afternoon of June 25th, 1990, a bolt of lightning from a dry thunder storm sent a deafening explosion echoing over the ridge from the direction of Dude Creek, north of Payson. (Dude Creek is so named because a fellow named Frank McClintock who once settled there was thought by old-timers to be something of a city dude, not familiar with the wilderness under the Mogollon Rim.) About twenty minutes later a small airplane flew over the canyon. It was a spotter plane for the Forest Service. Within the hour bombers with their loads of fire retarding slurry were making regular runs heading for the spreading fire. During the next twenty-four hours the Dude Fire got completely out of control and spread from five acres to almost thirty thousand acres of prime wilderness in the Tonto, Coconino, and Apache-Sitgreaves National Forests. On June 26th at about 2:00 p.m. a dry thunderstorm broke in the fire areas, blasting the firestorm in four directions at once. 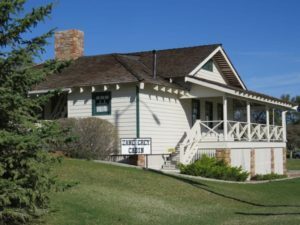 The fire engulfed homes in Bonita Creek Estates and the historic Pyle Ranch. In Walk Moore Canyon, just north of the Control Road, six firefighters were killed when they could not escape from the fire and the hot winds produced by this type of plume-dominated fire. The six were volunteers from Perryville State Prison in Phoenix; five inmates and one prison supervisor. On June 27th, the governor declared northern Gila County a disaster area and the Town of Payson proclaimed a local emergency. 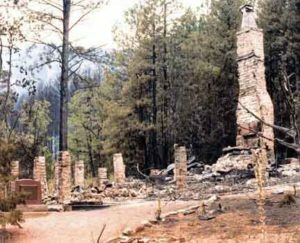 By the next day the fire had destroyed over 21,000 acres and burned the historic Zane Grey Cabin and other structures. Forest Road 300 served as a boundary on the north that kept the fire from hopping up onto the Rim. By Sunday, July 1st, six days after it began, the fire was declared “under control” and evacuated residents were allowed to return. The Dude Fire was one of several historically large forest fires in the latter part of the 20th century. These fires underscored the fact that our forests needed better management and a new understanding of what makes a healthy forest. New proposals to thin the forests of unhealthy trees and brush are moving forward as are efforts to educate the public on the value of firewising their own properties. These efforts will help prevent future mega-fires and protect lives and property in forested areas. After the Dude Fire many improvements were made to the safety gear used by firefighters and changes were made to enhance communications and escape planning. 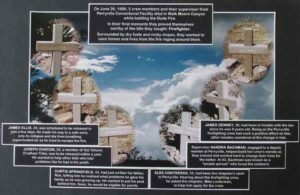 Six crosses were placed in Walk Moore Canyon where the six firefighters died. A short walk will take you to the markers for Sandra Bachman, James Denny, Curtis Springfield, James Ellis, Joseph Chacon, and Alex Contreras. 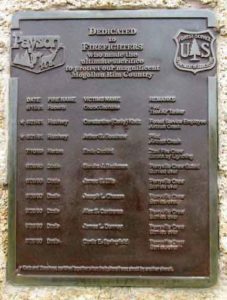 The Wildland Wildfire Firefighter Monument was dedicated in front of the Rim Country Museum on May 7, 1994. 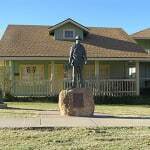 The replica of the Zane Grey Cabin was opened in Green Valley Park in October, 2005. 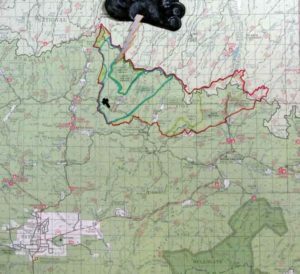 Map of the Dude Fire. The red line outlines the size of the fire. The black cross marks the location where six firefighters died in Walk Moore Canyon.